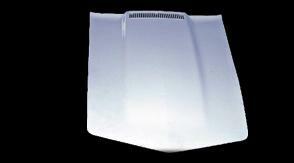 This L88 hood is manufactured by hand laminating, the patterned cut fiberglass mat and fiberglass resin are placed into a precision mold. This method produces high strength panels with uniform thickness and only one smooth side surface. These hoods are the long version without Fresh Air Chamber.